You are here: Home / News / MoonPie® Bites are Here! 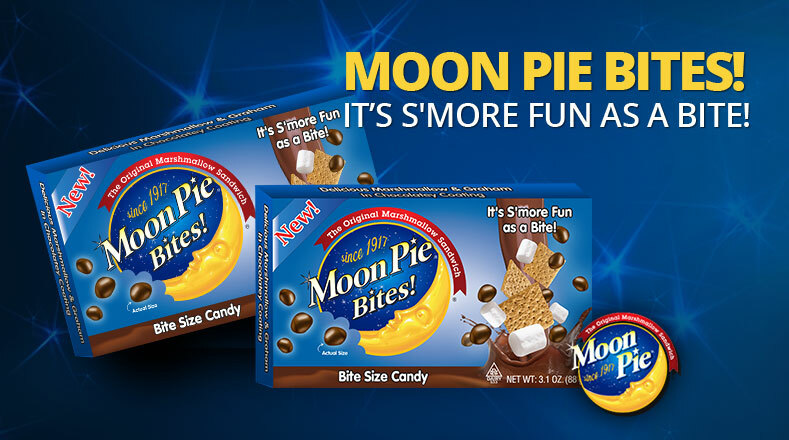 Santa Monica, CA – (July 14, 2015) – Taste of Nature, Inc. is introducing a line of Bite-Sized Candies based on the evergreen and iconic MoonPie® brand. These delicious candy treats combine classic graham, marshmallow and chocolate flavors in a delicious bite-sized treat that are simply “out of this world.” The product is expected to hit store shelves in Q3, in time for kids to enjoy a back-to-school treat – of course, adults can treat themselves anytime! ABOUT MOONPIE: Chattanooga Bakery was founded in 1902 as a subsidiary of the Mountain City Flour Mill. A fifth generation, family-owned business, the company made nearly 100 snack cake and cookie items under the Lookout™ trademark, named after the popular residential and tourist community near Chattanooga, Lookout Mountain. In 1917, after a brainstorming conversation between a bakery salesman and some Appalachian coal miners, the MoonPie was born, and by the late 1930’s was the bakery’s #1 seller, a spot it still occupies today. Where can I find these amazing treats in Portland, Oregon? I never knew about moon pie bites, till I found them at Ollie .